How did Cheeky Chompers come about? We lived through the challenges of teething with our own little ones and set up our business Cheeky Chompers on the back of this experience. When does teething actually start? Although teething usually begins around 6 months of age, it is normal for teething to start any time between 3 months and 12 months of age so it varies hugely from one child to the next. By the time your child is about 3 years old, he or she will have all 20 primary teeth. It is so hard to know sometimes if your child is teething. Yes, there are many signs and symptoms your little one is teething. Their gums can become inflamed, red and painful as the teeth start to push through. Your baby’s cheeks may appear flushed and they are likely to drool and dribble as well as gnaw whatever they can. It is common for your baby to go off their food, perhaps sleep poorly and they may not be themselves during the day. The magic question: What can we do? 1. Gum Massage: Your baby’s gums are going through a tough time. They will be tender and sensitive, so try giving them a gentle massage with a clean finger. This helps reduce the pressure and provides a soothing feeling for them. 2. Cool Water: Giving your baby cool water not only soothes their gums but it also helps with the excessive dribbling. Just make sure it’s not too cold. We don’t want to cause any more pain! 3. Teething Gel: Teething gels can be great for easing your little one’s pain. It can be rubbed on the babies gum with a clean finger or even better, you can rub it onto the Neckerchew’s teether. Your baby will naturally chew on the area causing them discomfort. This is perfect as it gets the gel on the right spot. We know that can be a challenge! 4. Chilled Teething Rings: A chilled teething ring is a great way to help with getting your baby through the teething stage. It gives your little one something to chomp on while the cool teething ring will ease the discomfort on their gums. 5. 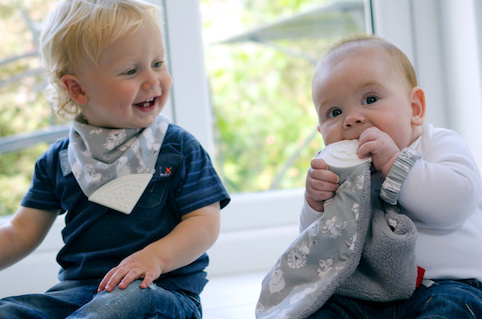 Cheeky Chompers: We developed the original chewy dribble bib; the Neckerchew based on experience with our own little ones. It is an easy way to absorb that dribble to avoid rashes; gives your little one something to chomp on; and won’t fall on the floor. We have gone on to develop other teething solutions such as the Comfortchew and Chewy the Teething Hippo. All our fabric products are made in the UK and are both attachable and machine washable so you have no concerns about your baby putting them in his or her mouth! We would also recommend cuddles! Your little ones are in pain and feeling vulnerable so a little extra attention helps. Chilled fruit smoothies and purees can also help soothe teething pain. We have some Cheeky Chompers goodies to give away. 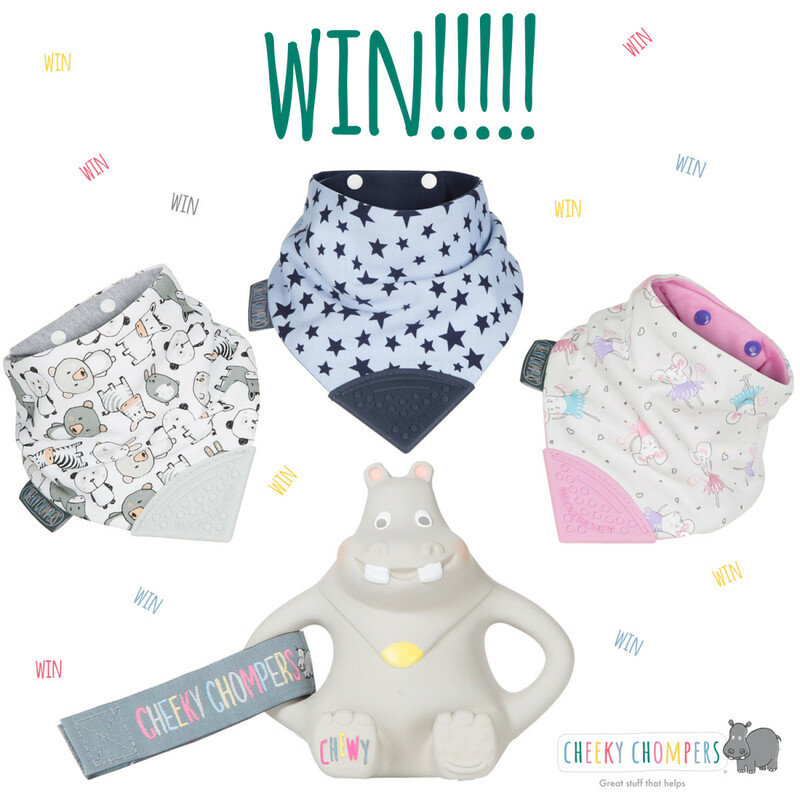 You can win a Cheeky Chompers Neckerchew (in either Ballerina Mice, Panda Pals or Twinkle Twinkle design) AND a Chewy Hippo teether – we have 5 prizes of each set to give away. Visit our Facebook, Instagram or Twitter page to enter.